Subramanian Swamy’s “nuclear bomb‘” in the National Herald case is finally out. 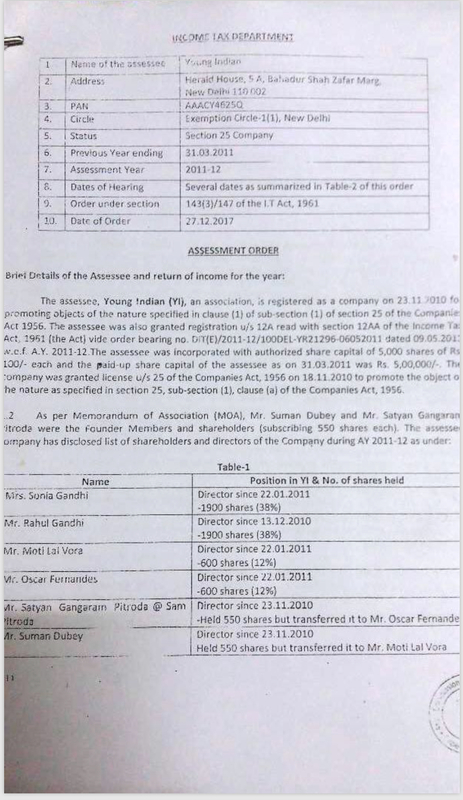 Swamy today produced in court was an Income Tax assessment order against the Gandhi family owned company Young Indian. 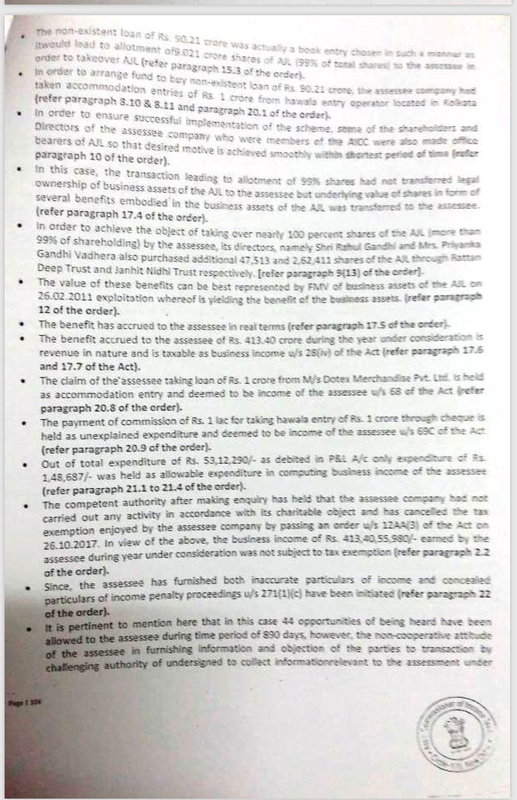 The 105 page order dated 27th December says Congress claim of Rs. 90 Crore loan to AJL was “bogus”. It orders Young Indian to pay tax for concealed income of Rs. 414 crore. 1. 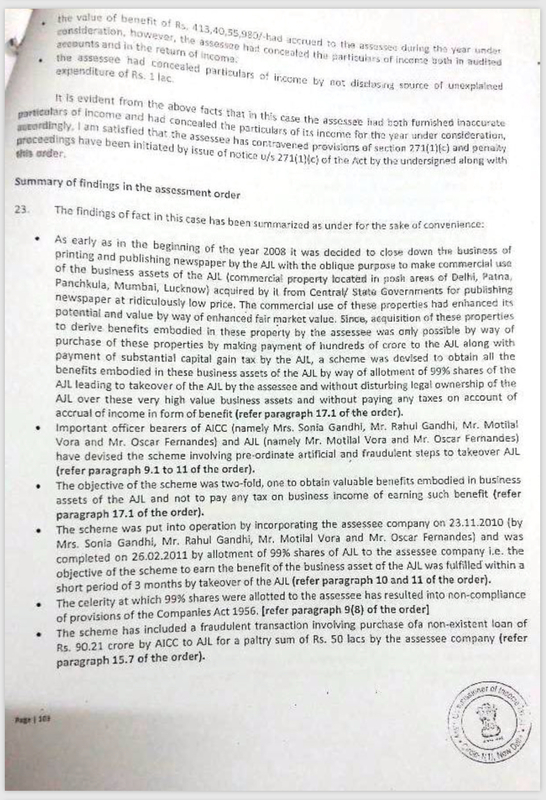 Associated Journals Limited (AJL), owner of the National Herald newspaper which was established by Jawaharlal Nehru, decided to close down the business of publishing the newspaper in 2008, with the “oblique purpose” of making commercial use of the properties owned by AJL. The order also notes that these properties were obtained by AJL from Central and State Governments at “ridiculously low prices”. 3. The scheme was put into force on 23.11.2010 when Young Indian (YI), the company was incorporated and within 3 months i.e. by 26.02.2011 the scheme had been completed. In this time, 99% shares of AJL were allotted to YI. The order also claims that such a transfer violated the norms of the Companies Act as it existed on that day. 4. The scheme, the order says, involved the “purchase of a non-existent loan of Rs 90.21 cr, by AICC to AJL, for a paltry sum of Rs 50 lacs”. The loan, the order claims, was in fact a book entry to transfer ownership of AJL. 5. Next, the order claims that to arrange funds to but the non-existent loan as above, YI “had taken accommodation entries” of Rs 1 crore from a hawala entry operator in Kolkata. The order elaborates the nature of this “accommodation entry”. 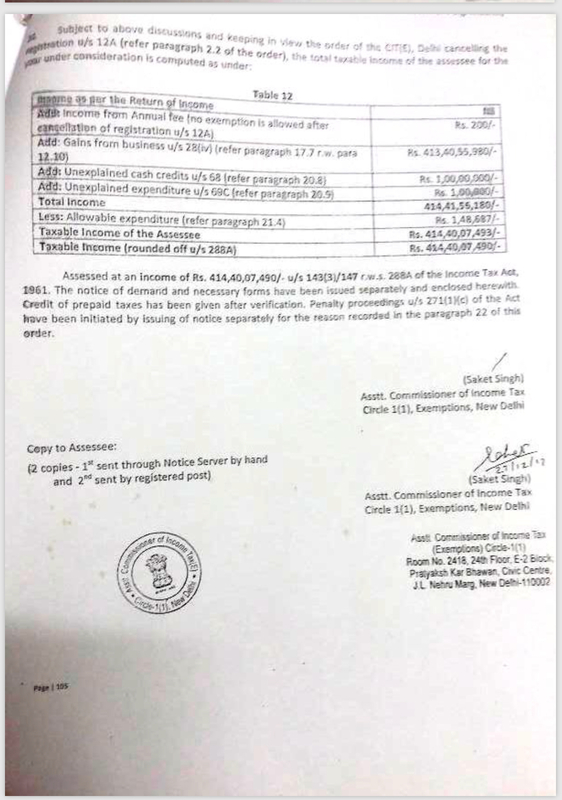 YI had claimed it had taken a Rs 1 cr loan from a M/s Dotex Merchandise Pvt Ltd. This, the Income Tax Department has deemed as an “accommodation entry” has deemed the commission of Rs 1 lac paid for the above, as “unexplained expenditure”. 6. The order states that although YI had been registered as a charitable company, it had not carried out activities in line with its stated objects, hence the tax exemption of YI was cancelled. 7. The order states that by the above “scheme” YI “benefit had accrued to it in real terms” and as per the Fair Market Value, was valued at Rs 413.40 crores. 8. The order also mentions that 44 opportunities to be heard were given to YI, over a period of 890 days, but YI and its representatives showed “non-cooperative attitude” in furnishing information and “challenged the authority” of the officer to collect information in the case. The order thus makes it amply clear that the entire transaction was a sham and as engineered to transfer assets from AJL to YI without the need to pay tax. And Sonia and Rahul Gandhi each reportedly hold a 38% stake in YI. The findings are therefore broadly in sync with what Dr Swamy has been alleging from day one. The order also makes a new point, that of YI having dealt with a hawala operator. The loan from the company M/s Dotex Merchandise Pvt Ltd. is in the eye of the storm and this thread itself may open up a different can of worms. It needs to be seen what stand the court takes in this matter now.